It’s not often that I indulge myself with a fast food breakfast. Too many calories, too many carbs, too much fat. Not to mention zero credit for fruits and vegetables. Most days, I toss a handful of spinach and a handful of mushrooms into a skillet, sautee them in olive oil for a couple of minutes and then and add feta cheese and bacon bits and a scrambled egg. Now that’s what I call a power meal. But even though that kind of breakfast doesn’t take long to fix, sometimes I’m just too rushed to do it. This has been especially true the past several mornings when I’ve had to dash out the door to work early voting at the Putnam County Election Commission. Which, conveniently, is located just up the road from my favorite fast food restaurant in the whole wide world. 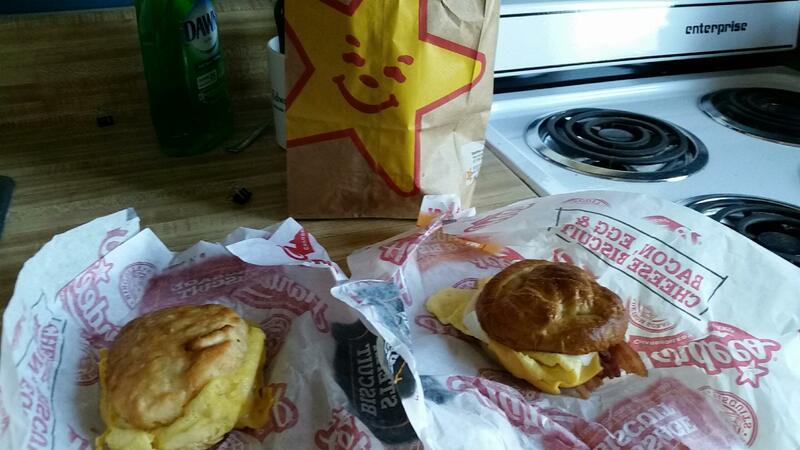 Say what you will about your grandma’s home cooking, nobody makes a better biscuit than Hardee’s. Big and brown and buttery and piled high with egg and gooey melted cheese and your choice of breakfast meats. Biscuits so greasy good that they leak through their wax paper wrapping and onto the sack. So greasy good that you need a dozen napkins to wipe your hands and face after eating one. So greasy good that they stave off hunger pains for hours. I salivate just thinking about one. Why mess with success by offering alternatives to biscuits? It seemed downright silly when Hardee’s began offering English muffins and flour tortillas as a “healthy” option. Now they’ve taken it a step further by putting meat, egg and cheese on a pretzel bun and calling it a breakfast sandwich. And then tempting us to try it by offering buy-one-get-one-free coupons. I took the bait. Not because I thought I might actually like pretzel sandwiches, because I don’t even particularly like pretzels, but the price was right and—more than that—I thought I might just get a column out of the experience. So last Saturday morning I joined the long line of cars (eleven ahead of me!) in the drive-thru line at Hardee’s on South Willow Avenue. I didn’t open the sack—which, oddly enough, wasn’t stained with grease–until I got to work. I peeled back the wax paper from the first sandwich and my heart fell. The sandwich looked soggy and mashed, kind of like somebody had sat on it. The edges of the egg flopped limply over the sides of the pretzel. The cheese wasn’t melted all the way. But my stomach was growling and it was almost time to clock in and what could I do but take a bite and hope for the best? The bread was dense. Slightly sweet. Chewy enough to be hard on the teeth. Yuck. But wait. Had I set myself up for this conclusion? Had I been so smugly certain that a breakfast pretzel couldn’t compare to a breakfast biscuit that I didn’t give it a fair chance? Was I really so old and set in my ways that I couldn’t appreciate something new and different? Possible, but I think not. The pretzel sandwich wasn’t awful. It just wasn’t very good. Certainly not good enough to eat the “free” second one, which I tossed into the trash. If I’m going to spend 500 calories on a fast food breakfast, I’ll never again waste them on anything but a big, buttery, brown biscuit.